Let’s face it, some of the most beautiful items in your house may also be some of the least durable. Your antique crystal set of plates are to die for, but they’re more delicate than anything else you’ve ever owned. One little drop or slight slip, and your most favored possessions could end up in sharps and ruins. Whether you’ve purchased a new house or apartment, you may be more than just a little excited to arrive at your new destination. We get it. The waves at your new beach house are calling you in the distance. Don’t just throw all of your belongings in a box and call it a day, though. You don’t want to have your excitement dissipate into disappointment when you realize your great grandmother’s glass bird collection is now a messy array of broken wings and one-legged blue-jays. Ensure your delicate items receive the packaging they require and deserve by setting aside the appropriate amount of time to properly wrap and box them up beforehand. You shouldn’t wait until the day before your move to quickly wrap your glassware and dishes in some crumpled up newspaper and finish them off by tossing them all in one big box. Ideally, you should start prepping about a month in advance and take the time to neatly and carefully package each item individually. If you’re looking to cut corners by packing all of your delicate items in one large box marked FRAGILE on the outside, don’t. While your box may say fragile and project an aura of safety and security, you may just find your beloved belongings have transformed into an unrecognizable array of broken pieces. Sometimes, more is better. This is especially true when packing your delicate materials. Purchasing more boxes ensures you don’t have to worry about multiple pieces banging against one another during the relocation process. Size-specific boxes that will accurately match up to the dimensions of the products you are placing inside often work best, too. For example, you don’t need a giant storage box to move one little crystal bowl. Also, while you may have a bunch of boxes hanging around your basement from your last move, don’t be tempted to reuse them. Old boxes may become weak and flimsy over time, especially in damp environments, such as a basement, or humid surroundings, such as an attic. You may have a bunch of unread newspapers laying around, but think twice before you use The New York Times to wrap up your glassware and fragile materials. Newspaper leaves behind a black residue from the ink, which necessitates a thorough cleaning of your items after moving. Towels are as plentiful as newspapers, but they pose issues as well. Towels and cloths fail to keep materials in place and can be slippery. To ensure your materials arrive safely in one piece, use bubble wrap and packing materials to wrap your items. 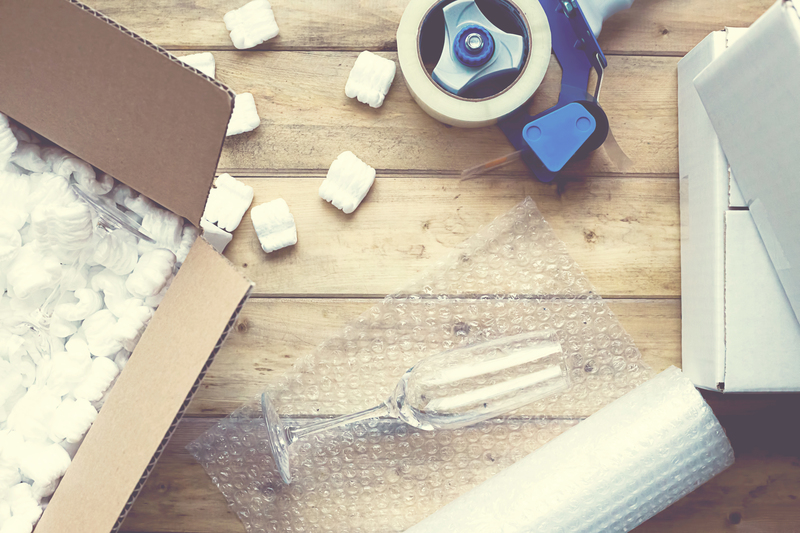 While you may be tempted to skip the added expenses of packing-specific materials, your investment will be well worth it when your delicate wares arrive safely. Moving in general is sometimes stressful, but transporting delicate materials? That’s in a whole other ballpark of pressure. Whether you’re still unsure how best to package your fragile crystals or don’t want to risk your fine china set arriving in shattered pieces, you’ll be glad to know there are professionals who can take care of everything so you don’t have to. Professional movers are skilled in wrapping, packing and safely transporting your items from point A to point B. Don’t let the stress of moving keep you from brimming with the excitement and happiness you deserve. Searching for a moving service that offers relocation services for you and your family? Look no further! Mid Atlantic Van Lines is one of the best packing and moving companies you can use. Whether you need the extra assurance of quality transportation or require an extra helping hand in ensuring your valuable materials retain their worth, we’re ready to help your move proceed smoothly and efficiently.